This morning, I woke up with a start. For some reason, the alarm hadn’t gone off. The clock said 6:46 a.m.
“Oh No!” I’m late for bus duty already! Second day in and I was going to be late. I jumped in for a quick shower and my mind was rushing. Wait a minute, didn’t I test the students yesterday (a Friday ritual), and didn’t we have a baseball game? And weren’t we scheduled to have a baseball game on Friday this week? Yep, you’ve got it. It was Saturday! I wasn’t late for bus duty. I wasn’t late for school and the reason why the alarm wasn’t set was because last night I had much more presence of mind to realize that I didn’t need to get up quite so early on the only day that I can sleep in. I was mad for about half a second, and then so happy and relieved that I didn’t need to rush through yet another day! So, I went downstairs, made my coffee, grabbed my Bible and devotional, and went out to the front porch. Turns out that I had company. This little baby bird was already there on the bush right next to the porch steps. And why I am sharing this for the weekly photo challenge with the word “Intricate”? Because the intricacies of a bird’s feather’s amaze me. I’m not sure how long this little one has been out of the nest, or hatched from the egg. But I do know that it is just incredible how every little detail of it’s wings, it’s feathers, it’s beak,…everything, is intricately formed. Intricately Designed. It just made me smile to see this little bird and the detail of it’s feathers. It encourages me so much to truly believe that there is a Creator who created and designed all of the intricacies of this world that we live in. He not only designed the package, the outward parts, but the inner parts, the function, the purpose of the creations. When I sat down to take a picture, it wasn’t long before the little baby bird, bobbled on the branch, and took off in flight! Yes, it’s feathers, it’s wings, it’s form were intricately designed, but it’s function? It was made to fly. It’s intrinsic nature is to fly. So here’s the thing. Although we may not have wings, or feathers, I think you and I were made to fly as well. We all have outward ‘packages’ or forms that are so unique, but so intricately designed. And we have inward purposes and abilities and gifts that we were equipped with long before we could even talk or walk. The baby bird started to flutter off into the air, and then it wasn’t long before it dropped to the grass just before it reached a tree in a branch. But I’m sure it will find it’s way to fly. It was born to fly. And you and I? We may have fluttering times of not quite reaching our destinations or goals. But may we keep reaching and using the gifts that we were born to use. I believe with all of my heart that the Creator who intricately designed us, has a purpose for us to give Him glory and to impact our world. And sometimes we flutter a bit. But may we just keep fluttering and flying. May, as Oswald Chambers says (in today’s devotion by the way) , .”..may our reach extend our grasp.” May our desire and tenacity to keep pushing forward and growing in the use of our gifts and abilities …extend beyond our accomplishments or successes. May our reach extend our grasp. 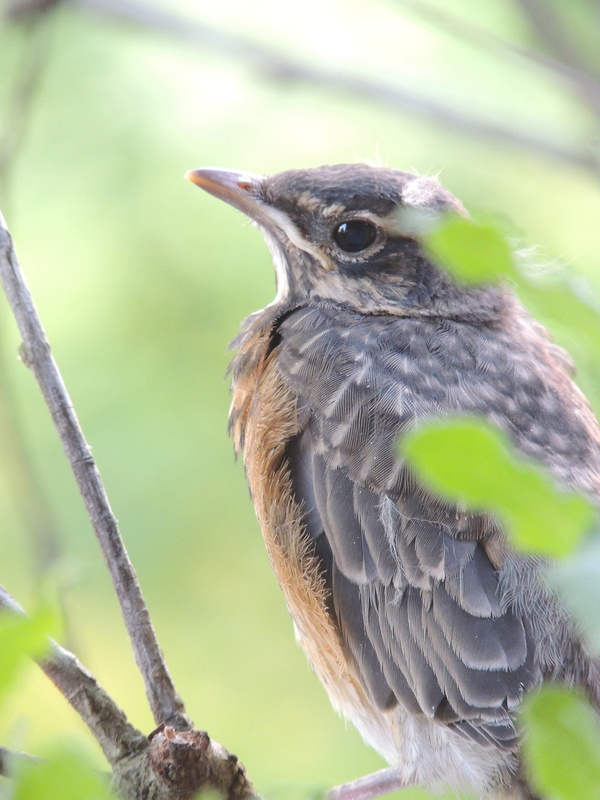 So, after seeing this baby bird and thinking all of this through….well, maybe it wasn’t so bad to be up on a Saturday morning at 6:46 in the morning. A blessed Saturday morning to you, Heather. I laughed when I read this, as I’ve gone through similar times. There are also times when I wake up and can’t remember what day it is. I enjoyed your photo and thoughts and have commented on several other posts that the intricacies of nature, to say nothing of those of the human body, are enough for me to believe that the world was created. The Bible says that nature shouts that there is a God (paraphrased by me) and I believe that’s true. oh, thank you for sharing! A blessed Saturday to you as well! And yes, I love how nature shouts of God…and whispers at the same time I think! Praying for ears to hear and eyes to see 🙂 Blessings to you and yours, Janet! How beautiful, Heather! I smiled all the way through your post. Thank you for sharing such encouragement! Oh, good! And I smiled as I read your comment. Thanks so much for sharing!